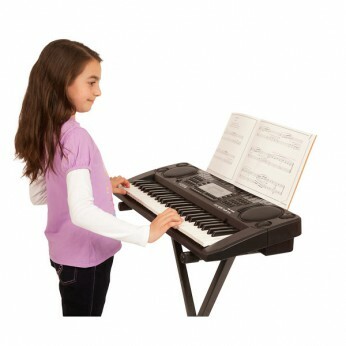 54 full size keys.100 tones and rhythms.5 percussions.10 demonstration songs.2 guide modes and 3 sound effects.Single finger /Fingered chord.Record play, program and playback.Double stereo speakers.Includes stand for songbook. Adaptor included. Keyboard stand not included…. This toy costs approximately £44.99 (for the latest and best prices make sure you check our retailer list for the SK-560 Keyboard above). In our review of SK-560 Keyboard we classed it as being suitable for ages 3 years, 4 years, 5 years but recommend you check the manufacturer specific advice before purchasing.